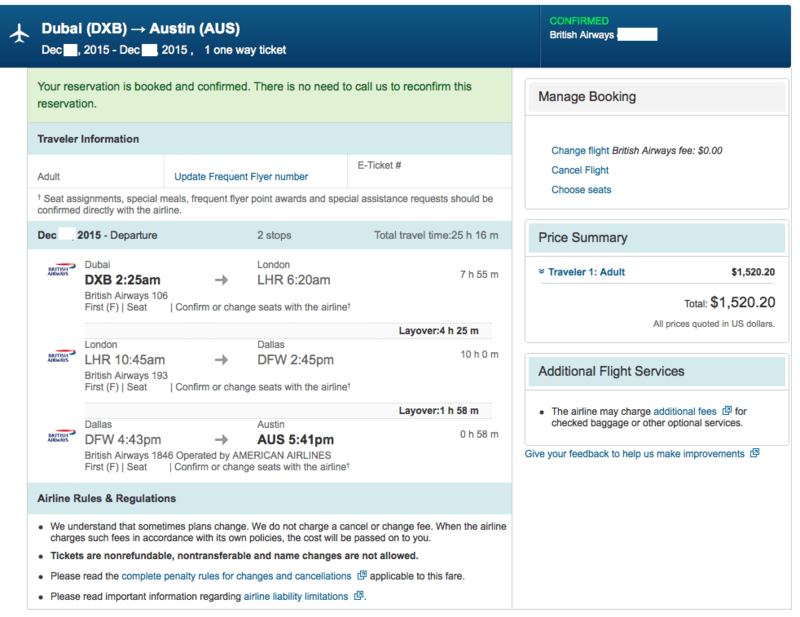 Last week there was some buzz over a (possible) mistake fare from Dubai (DXB) to Austin, Texas (AUS) on British Airways and partner airlines, all in First Class. Mileage runs are usually cheaper (this one, for me at least, worked out to be 7.4 cents per mile). And having a one way from the middle east is not super helpful. I learned about the deal while in Disneyland with my nephew and other family members and only had my iPad available to work on the itinerary. I booked through the devil OTA because by the time I was ready to pull the trigger, BA.com had already caught the mistake fare and removed it (but Expedia was still live). I wanted to make sure that all my segments were in First Class (some BA flights from LHR to US cities do not have a First Class, only Business). My ticket has been confirmed and I even was able to choose my seat. Others in the Flyer Talk forum have not been as lucky, no clue why mine ticketed while others have not yet. First, I have flirted with the idea of going to Dubai for some time, however the long flight has always been a deterrent. But the pain of 17 hours in a plane is alleviated to some degree by my second reason. Second, I have never flown international First Class. I have two international trips coming up but neither are in First (one is in Business and one is in Economy Plus). While I understand that BA does not have the best First Class product, it is still international First Class and something I have wanted to experience. Plus you get access to BA’s First Class lounges, including the Concord Room at LHR where you can get a free massage and a personal cabana. Third, it is refundable. If I decide I don’t want to go, I can simply get a refund. I didn’t book my flight until the end of the year, so I have some time to figure it out. Fourth, it would get me very close to Alaska Airlines MVP Gold 75k. The one way flight will net me about 12,000 miles on Alaska. Again, I could get these EQM cheaper some place else, so this isn’t my only reason. My thought is to see if I can find another great deal in the next few months to get over to Dubai. Or work on using miles to get there. I have considered flying KLM using Alaska miles (70,000 miles for First Class) that would allow me to spend a few days in Amsterdam, one of the few European cities I haven’t visited. If nothing materializes in the next few months, then I can cancel and start looking for the next deal. While this mileage run Dubai in First Class on British Airways may not be the cheapest way to get miles, it is definitely luxurious.